Ronan Daly is joining his brother Conor across the Atlantic. Roscommon's Ronan Daly is heading to the USA for the summer. 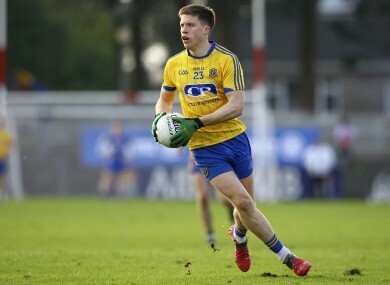 The youngest of the three Daly brothers, Ronan (21) came off the bench in Roscommon’s quarter-final victory over Leitrim, but informed the team’s managers of his decision to leave a few days later. Joint manager O’Donnell admitted it was a surprise to hear the Padraig Pearses man was departing, but he also silenced rumours that U21 star Ultan Harney was set to quit the panel along with the duo. “Ronan Daly is gone now as well. Ronan played against Leitrim and then on the Wednesday after that he told us he was going to America,” said O’Donnell. “Ultan is still with us, he hasn’t jumped ship, but you never know. Ultan has been very unlucky with injury, he’s been plagued the last couple of years, but he needs a break to get back on track. With two championship wins under their belt already this season Roscommon will be favourites to overturn last year’s result and beat Niall Carew’s Sligo and reach the Connacht final against either champions Mayo or Galway. However, injuries are still a concern for O’Donnell and McStay — although the return of Enda and Donie Smith, and Ian Kilbride to training is encouraging. “The further we go in the championship the better we’ll be with regard to injuries. Lads like Enda Smith and Donie Smith are back in with us now, Ian Kilbride is back running,” added O’Donnell. But could lads feature in the 26 next week? We’d be hopeful that Enda Smith and Donie Smith should be in competition for that. “Other lads, it might be a game too early. Ronan Stack still isn’t back yet, but Cathal Compton is due back to training this weekend. Here are the 6 nominees for the GAA player of the month awards but who gets your vote? Email “Roscommon rocked as another player leaves for United States and set to miss championship”. Feedback on “Roscommon rocked as another player leaves for United States and set to miss championship”.